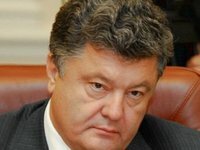 Ukraine's independent parliamentarian and presidential candidate Petro Poroshenko has said that a concept of constitutional changes must be presented before the May 25 presidential election. "It is extremely important to do a presentation of a concept of constitutional changes, which will be agreed upon with the Venice Commission and balance the power, before the presidential election," he told a Zhytomyr regional broadcasting company on Friday. Changes to the Ukrainian Fundamental Law will involve decentralization of power, whereby financial opportunities are handed over along with responsibilities to territorial communities, Poroshenko said. "The presidential functions will be represented (in the regions) by a prefect who will make sure there is no corruption - that will be the control on the subject of corrupt activities … and if something is not going right, the prefect will have power to suspend any particular illegal resolution of a local council," the parliamentarian said. Under the constitutional changes, the president will have power to disband a local council and ask voters to elect new representatives, Poroshenko said.